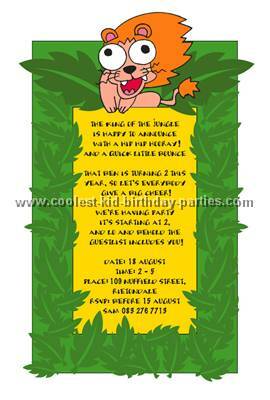 For my son’s 1st birthday we had a Jungle Safari party. 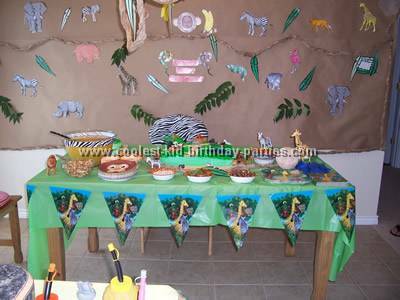 This is a good theme for any age and there are endless safari birthday party ideas to be found. I covered the wall behind the kitchen table in my dinning room with craft paper I purchased at Lowes. I put up an assortment of animals that I printed off the computer and colored. Then, I laminated all the animals using clear contact paper. To laminate just cut two pieces of contact paper to fit over the animal and place them sticky side to sticky side with the animal in between the cut out around the animal. I printed leaves I found online, laminated them and then hung them up. With the craft paper I made vines to go around the craft paper on the wall. To make the vines I cut the craft paper in strips and twisted it. I hung the vine and leaves around the chandelier and in the entry way of the dinning room. The morning of the party we cut some leaves off of the trees in the yard and hung them around too. I hung a banner on the wall that said happy birthday with jungle animals on it from the dollar store. For the table I used a solid green table cloth and hung another banner from the dollar store on the front of it. I used strips of zebra material around the serving dishes. I used zebra material and made a slip cover to go over the baby’s high chair. 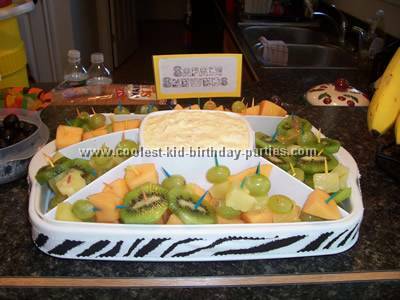 It looked great in the photos and was one of those fun Safari birthday party ideas. I used the zoo pals plates and bowls for cake and ice cream. For the front door, I made a banner out of craft paper and vines. I put “Drew’s Party” in big letters I printed using crazy zoo font I downloaded from online onto construction paper and laminated these as well. I printed out “its A Jungle in There” out of leaf letters I found in clip art laminated them and hung them on the top of the sign for the door. Then I hung jungle animals all around the banner on the door. I cut out photos of my son’s face and placed them on a face of a monkey and lion’s head I printed and hung up. I taped laminated paws I printed that said “Drew’s party ahead” on the sidewalk leading up to the door. Also, I had another table with a solid yellow table cloth where I put the kids favor bags and more snacks. I put vines around this table and set out zoo animal sipper cups I ordered from OTC for all the kids. 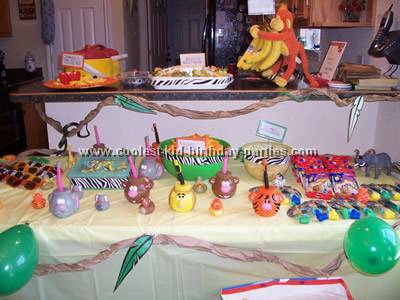 I also placed some of the jungle safari animals my kids already had around for decoration. I made my son his own individual cake since he was turning One. I made it round out of white and chocolate using a zebra effect by in the center spooning in a little white cake mix then spooning in a little chocolate cake mix following this patter until your pan is ¾. After baking and letting it cool I iced it green. I made two circles on top and filled them in with ground up graham crackers. 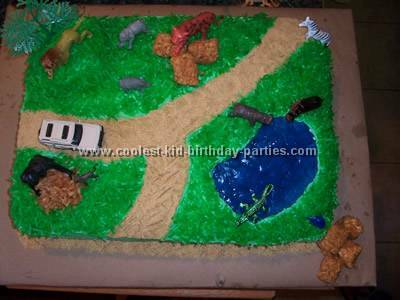 Around the two circles and on the bottom edge of the cake we placed grass we made out of coconut. I made by shaking a table spoon of milk with some green food coloring and shredded coconut in zip lock. I placed a little toy giraffe in one circle and a #1 candle in the other. Then I placed it on a plate and put graham crackers around it. For the big cake we made 2 layers out of white and chocolate. The white cake was on top. I made cakes the day before the party and placed the white cake in the freezer. While it was freezing I made berry blue Jell-O as directed on the package and placed in fridge. Just as Jell-O started getting thick I pulled the cake out of freezer and cut a hole in shape of pond out of the cake. 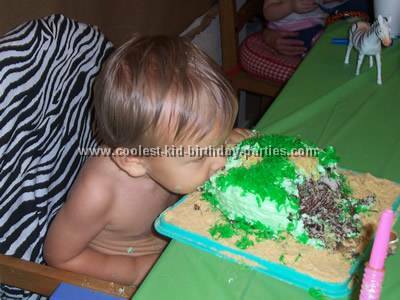 Be sure not to go to close to edge or through the bottom of the cake. Then I put the Jell-O into the hole and place in fridge for a couple of hours. I iced the whole cake green and then we made a road using graham cracker crumbs. Also, I made a hill out of the cake we cut out for the Jell-O. I covered all the top but road and pond with green coconut and put green coconut around the bottom edge of cake. Then I placed plastic animals and trees we bought at Wal-Mart on top. I put a safari jeep match box car on the road I found at Wal-Mart. I used toasted coconut covered marshmallows for rocks. For the snacks I made cute little labels out of the crazy zoo font also. I printed the names on to labels and placed them on colored construction paper. I then laminated them. For the punch I made my version of Jungle Juice combining orange Kool-aid with ginger ale and pineapple juice. I placed it in my clear punch bowl and put a strip of zebra material around the bowl. Then, I labeled it Jungle Juice. I made Safari Skewers on toothpicks using cantaloupe pineapple and kiwi with Hawaiian fruit dip. The veggie tray was on a round platter in the shape of a lions face using carrots for the mane sliced round yellow squash for the face and black olives for the eyes. I placed the olives in a small hole I cut in two pieces of the yellow squash so that they would stand up. I used a red bell pepper labeled and filled with rumble in the jungle ranch dip (ranch dressing dip). Also, I served zebra snack cakes, bananas tiger tails (cheetos), animal crackers, gummy worms and banana fruit puffs. 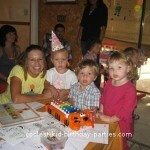 Safari birthday party ideas for Goodie bags: I made cute little monkey bags out of brown paper bags. Then I cut out a large tan circle from construction paper and cut it horizontally but left the top half a little bigger. I glued it to the bag and glued 2 black dots for eyes on top of that. Then I cut med brown circle and placed a smaller tan circle inside of it. Then I folded one side of the ears and put the glue on the fold placing it on the bag. Inside I placed a safari rubber ducky, animal print sun glasses, animal crackers and banana runts from OTC. We started off playing animal charades. I printed photos and names of animals and placed them on index cards. We split into two teams. Then we were allowed to act out the animal on the card we received and or make the sounds of the animal. At the end we had one more prize for the person who could do the best monkey. We also had coconut bowling. I bought a coconut and 10 bottles 1/2 full of water. I printed labels for them that said coconut bowling with a pick of a palm tree and a monkey. Then I laminated a piece of construction paper with 10 circles I cut the size of the bottle in the shape of a bowling pin set up. I tape this down on the drive way and put another piece of construction paper with a picture of a monkey and a coconut a few feet away that said Monkeys line up here for bowling. We had hours of fun with this until my niece busted the coconut. I downloaded a CD with animal songs such as “The lion sleeps tonight” and “George of the jungle” and placed numbers I printed and laminated on construction paper on the ground. Then I started the music and everyone went around and then stopped the music and everyone stopped. I pulled a number out of the bag and whoever was on that number one a small candy bar. Also I downloaded animal sounds on a CD and had it playing in the background of the party the whole time. After the party I uploaded the pictures and printed off thank you cards from Wal-Mart’s photo department. I placed four great photos on the front of the card and the inside said “Just wanted to send a load ROAR thanking you for coming to my party and for the great gifts. I hope you’ve enjoyed my Safari birthday party ideas. 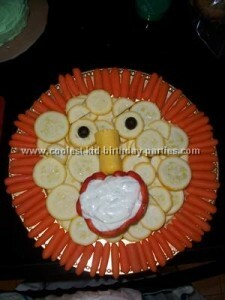 The Safari birthday party ideas and photos in this section have been graciously submitted by readers like yourself. 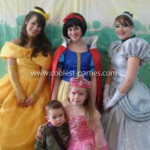 If you’ve got some cool safari birthday party ideas and photos to share, we’d love for you to send them over. You’ll be taking part in creating the Web’s ultimate kids birthday party ideas resource that’s ALWAYS FREE for everyone to enjoy! Thanks!